Matthew Morgan, CEO of Tryke Companies, looks at cannabis nearly ready for harvest at Reef Dispensaries, 3400 Western Ave., on Wednesday, Feb. 15, 2017. 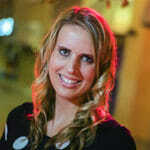 Photo by Jeff Scheid. Behind a security-monitored door of a 165,000-square-foot building located just west of the Las Vegas Strip lies a labyrinth of hallways and rooms. The gray-painted floors, white walls and people clad in scrubs, white coats and bouffant caps give the appearance of a hospital basement — until the scent of cannabis wafting through the air hits you. Welcome to the inner workings of Reef Dispensaries’ Las Vegas operation, where climate-controlled rooms contain marijuana plants in varying stages of growth. Right now, the dispensary, which opened in April 2016, only sells cannabis products to people who possess a medical marijuana card from any state. But that will change this summer. Matthew Morgan, CEO of Tryke Companies, which owns and operates Reef Dispensaries, said the location’s retail center will begin selling recreational marijuana July 1. 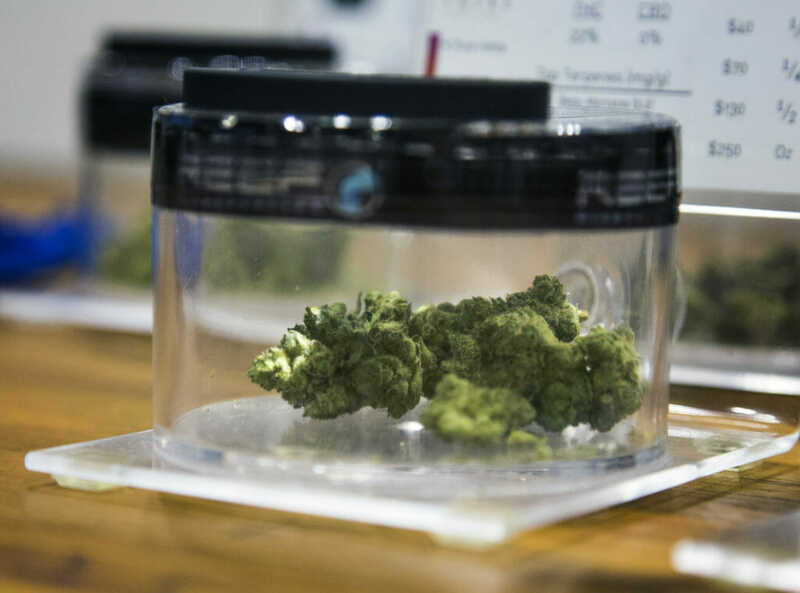 Nevada voters in November approved a ballot question to legalize recreational marijuana, but as state officials craft regulations, it can’t be sold quite yet. A medical marijuana patient, right, pays for cannabis at Reef Dispensaries at 3400 Western Ave. on Feb. 15, 2017. Photo by Jeff Scheid. The lag time is letting dispensaries gear up for an expected frenzy when recreational marijuana finally hits the market this summer. Reef Dispensaries is beefing up its staff, reworking traffic flow in its retail center and adding more cashier stations for the likely influx of demand, Morgan said. Keeping Reef Dispensaries’ retail center full of marijuana products — flowers, edibles and concentrates — takes time. 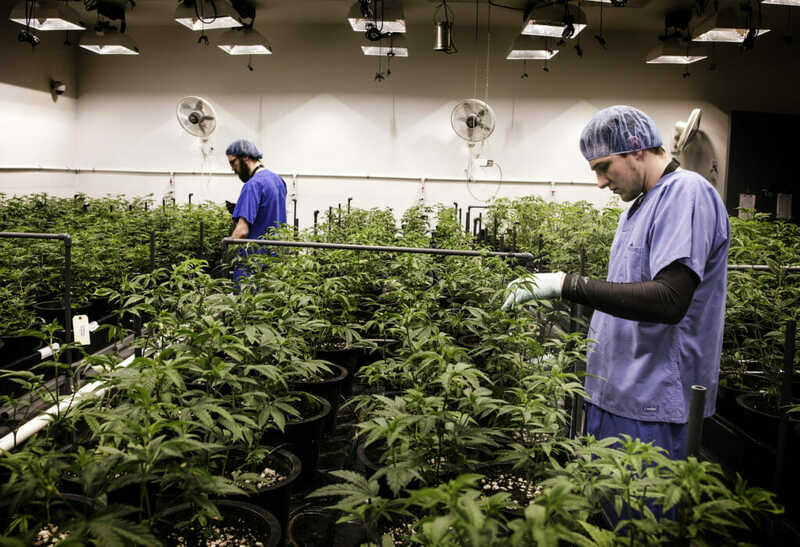 The Nevada Independent recently toured the Las Vegas facility and learned the 16- to 18-week process for turning a fledgling cannabis plant into a packaged product of marijuana, ready for sale and use. An employee prepares cannabis for planting in the propagation room at Reef Dispensaries, 3400 Western Ave., on Feb. 15, 2017. Photo by Jeff Scheid. Reef Dispensaries doesn’t grow a marijuana plant from a seed each time. It relies on “mother” plants and a cloning process to replicate high-quality marijuana, Morgan said. Employees cut a portion of the mother plant and stick it in a potting cube with a rooting hormone, he said. About 10 days later, it has created a rooting system and is an identical clone of the mother plant. The cloning room contains 6,000 “clones” on any given day. Employees for Reef Dispensaries sets up irrigation drip systems for cannabis on Feb. 15, 2017. Photo by Jeff Scheid. Once the cloned plants have established a root system, they move to the vegetative room, where they’re under 24 hours of light and exposed to four times the normal rate of carbon dioxide. The plants stay here for two to three weeks. The room temperature is 80 degrees during the day and 70 degrees at night. Cannabis plant nearly ready for harvest at Reef Dispensaries, 3400 Western Ave., on Feb. 15, 2017. Photo by Jeff Scheid. After the vegetative room, the growing plants head to a flowering room. The room’s 12 hours of daylight followed by 12 hours of darkness trigger the plants to enter a reproductive state and grow buds, Morgan said. The plants, all of which are female, remain in the room for seven to 12 weeks until they’re harvested, he said. The facility boasts an automated, drip-feed system that gives the plants water and a proprietary blend of nutrients, which changes each week of the grow cycle. 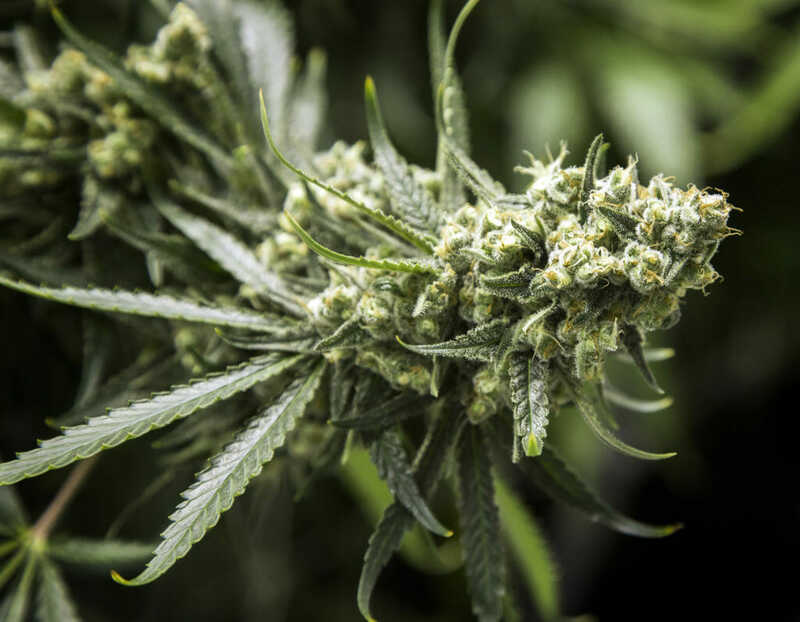 Because the dispensary essentially creates the perfect growing environment for cannabis, the buds become very heavy, so the plants require trellises for support by week eight or nine, Morgan said. In early March, the facility was operating 24 flowering rooms. The facility reclaims and reuses about 70 percent of its water. Cannabis hangs in the drying room at Reef Dispensaries,3400 Western Ave., on Feb. 15, 2017. Photo by Jeff Scheid. 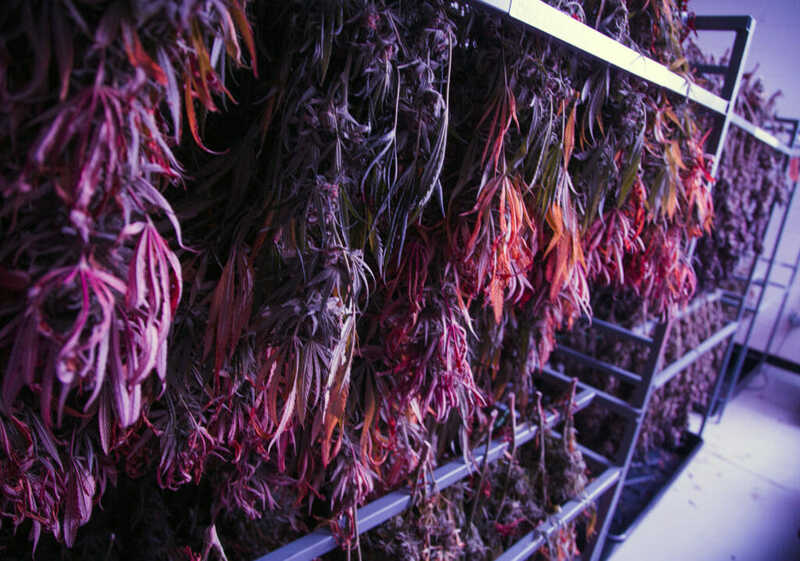 When employees deem the plants ripe for harvest, they cut them and bring them to a drying room, where they will hang for about 15 days in 60-degree temperature. Afterward, employees test every 5 pounds of marijuana to make sure it meets the company’s standards. Meanwhile, a team fully sterilizes the flowering room after each harvest, prepping it for the next round of plant inhabitants. Cannabis on display at Reef Dispensaries, 3400 Western Ave., on Feb. 15, 2017. Photo by Jeff Scheid. 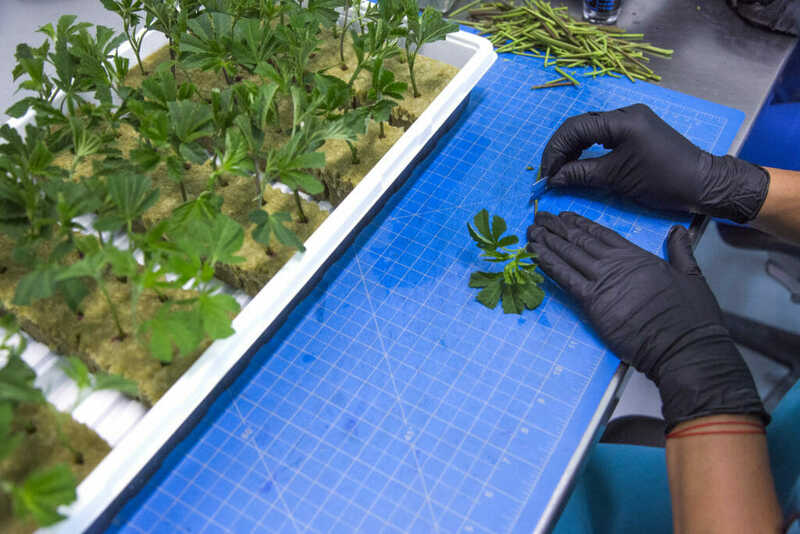 Aside from packaging, trimming the dried marijuana plants is the last step in the process. Employees use industry-specific shears to trim the leaves, revealing the desirable buds. Because it’s a delicate process, each employee trims about 1.25 pounds of marijuana per day, Morgan said. Once the marijuana flower is packaged, the product is ready to be sold. Prices vary by strain and amount: If you have a hankering for the “Purple Urkle” strain, for instance, that will cost you anywhere from $8 for a gram to $180 for an ounce. Prefer an ounce of the “Dutch Treat” strain? That retails for $250. The dispensary has roughly 300 different strains but only keeps about 50 in rotation at any given time, Morgan said. Caption: Matthew Morgan, CEO of Tryke Companies, looks at cannabis nearly ready for harvest at Reef Dispensaries, 3400 Western Ave., on Wednesday, Feb. 15, 2017. Photo by Jeff Scheid.